Traveling is a great way of recreation, and it can help you to heal stress or anxieties to a significant extent. If you love traveling, you need to be careful about certain things. The first thing is to choose the way you want to travel. Various travelers have their unique preferences. Some people love beach vacation with family. Some people love luxury or semi-luxury vacation. On the other hand, many people are there, who show love towards camping. It is a more cost-effective way of traveling, though it is even more enjoyable than other traveling methods. If you love camping, you need to be a person who knows a lot of things about such trips. Camping without knowledge of certain things could lead to losing excellent fun experience. In the following section, we shall discuss the things that you should keep when you are going on a camping trip. Those things are discussed in the following section of this article. In the modern world, we are accustomed to GPS devices. We can reach many unknown destinations easily with live GPS tracking and Google Map. All these things have made our lives easier. Have you ever wondered what people in the first era used to do? How did they use to find unknown destinations easily? Well, they had their GPS device, and that has been known as a compass. This is the primitive method of understanding the directions. When you go for a camping trip, you should remember to carry a good quality compass. 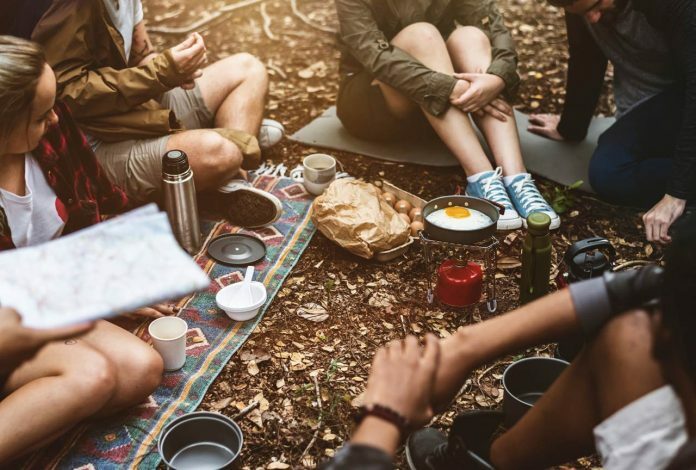 In most of the camping destinations, new GPS connection may not work due to mobile network failure or internet failure. In such a scenario, the magnetic compass will come out to be quite handy or useful. Camping and fishing are the two integral things. If you are traveling to Central Park NYC for the camping experience, you shall find options for fishing at those places. The fishes that you catch can be eaten too. You must have some great recipe books to prepare your own unique grilled camp fish. Well, you also have all the essential herbs and spices for cooking your fish. At this stage, the most important thing is to make a few additional arrangements, including creating campfire fish supper. Instead of using silver foils for cooking fish on the fire, you can use specially made campfire sheets for wrapping up the fish. The essential thing that you must have on your camping trip is the oven for cooking. A barbeque over is the perfect choice in this regard. You can grill vegetables and meats easily on such an oven. Nevertheless, you can also fry them, as per your requirements or recipes. Camping oven is not expensive too. Nevertheless, they come in easy portable sizes. As a result, the camping ovens become simple to be used as well as easy to be carried. Instead of carrying the barbeque ovens, you can choose to go for creating your ceramic oven. Creating a ceramic oven is not a difficult thing, especially when you know the art of crafting it. This is helpful when you do not want to carry an oven on your camping trip. The luggage or baggage will become significantly lower. It makes things simpler. The ceramic over is effective for grilling purposes. However, it cannot be a perfect substitute for the camping ovens that you find at the marketplace. Both of them have their pros and cons. You need to choose as per your convenience as well as requirements. If you are on a camping trip, canned tuna could be the best thing to be carried. Tuna is easy to digest as well as healthy fish. It comes with simplified fat and healthy cholesterol. Nevertheless, various recipes can be tried with this fish. It is simple to prepare a salad or sandwich filling with the canned tuna. It is healthy as well as simple to be digested. Moreover, on a family camping trip, it could prove to be quite useful. Since it is easy to digest, kids would love the tuna fish preparations. Tuna chunks or flakes can be used for foods for your pet. Both dogs and cats love to eat tuna. So, if you are carrying your pets, you should also carry canned tuna, salmon and other fishes. To keep your water hot for longer, you need to carry hot water bottles. In hot water bottles, you can store tea as well as coffee or any other hot beverages that you like. Overall, it is important to keep such a thing along with you. In camping destinations, nights often become chilly or nippy cold. To survive in such cold nights, you need warm water or hot beverages. This is why carrying the hot water bottle is so important as well as crucial for your camping trips. For camping trips, it is important to carry first aid kits. You may choose to carry lesser clothes, and that is perfectly okay. But, you should not forget to carry your first aid kits. It is important to carry as accidents may happen at any time. For example, you are going for the Central Park camping trip from NYC. Tourists popularly opt for the bike rides on this camping trip. It is also quite easy to get the Central Park bike rental. But, bike rides may fetch you certain injuries. To get quick healing treatments for such injuries, first aid kit has to be carried. Not just first aid kit, you should also have to carry the basic medicines that you may require to consume on a regular basis. Any trip with family and friends can be enjoyable, even Central Park bike rental outing. Planning a camping trip with a family member is fun, but at the same time, it is a difficult thing too. The planning process should be seamless, and it should incorporate all possible ideas to make the trip more enjoyable. The ultimate aim is to enjoy a great trip with friends as well as family members so that you can enjoy an escape from your daily life schedule. Previous articleHow to protect plants from frost and freeze? Sujain Thomas is a leading blog writer and expert travel photographer. He has written numerous articles and blog posts on topics related to Travel, Food, Lifestyle, and Photography etc.